Reggiolo is a rural cheese farming town in the heartlands of Italy’s north. Famous not only for its parmesan cheese, but a certain eyebrow-raising, world-class footballer and manager: Carlo Ancelotti. Born the son of a cheese farmer in 1959, he had an honest, traditional Italian upbringing, working the farm with his father and brother. Grown accustomed to hard-work and discipline from an early age, he developed the ambition to make something more of his life after watching his father slave away daily, working the land for little reward. “Football is not just a job. I grew up on a farm, football is a better life.” It was Ancelotti’s drive to be something more that took him from the field to the Reggiolo youth team, where he was spotted by Parma and snapped up. It was a shock for young Carlo going from the quiet rural town of his childhood to the loud bustling city, but he adapted like he would do so many more times in the future. With a dark, almost English, self-deprecating sense of humour he developed from his father, this is a man who is easy to get along with and notably down to earth. A man who lives and breathes football. Ancelotti would go from being a scared 15-year-old to an Italian icon, winning a scudetto and four Coppa Italia’s with Roma, to being part of that Milan team, managed by Arrigo Sacchi – the last team to win two consecutive European Cups. One of the finest Italian footballers of his generation, he left the game and stepped into management. He would go on to assist Sacchi at the 1994 World Cup and owes much of his coaching style to his mentor. Perhaps more disciplined than Sacchi, he retains his philosophical approach to the game. Shrugging off the label of “nearly man” after two second place finishes with Parma and Juventus, he has molded the image of a man who will win you trophies. After eight fruitful seasons in Milan under Silvio Berlusconi, he went on to win domestic titles with Chelsea and Paris Saint-Germain. Eventually he would arrive at Real Madrid and go on to win the Champions League and Copa del Rey in his first season. “The Future of Football: more dynamism.” The words of a young Ancelotti starting out in management. Ancelotti would guide Reggiana to Serie A after promotion from Serie B in his debut season as a manager, the last man to do so. Attracting the attention of bigger clubs, Parma approached him at the end of his maiden season as the man in charge. His home team, one that still has photos of a young Carlo on its walls, was devastated to see him leave. At Parma, he would go on to coach a team that boasted Gigi Buffon and Fabio Cannavaro along with a host of other Italian stars to second place in Serie A. He was developing a fast-growing reputation as a former player who now had the pedigree of a successful manager. He managed two seasons with Parma in which he had reasonable success in the league and Europe – though this success ultimately came without winning any trophies or threatening the elite clubs in Italy. It was one of these elite clubs, Juventus, who hired Ancelotti at the end of that second season in Parma. Juventus had just won back-to-back scudetti under Marcello Lippi and expected much the same from Ancelotti. Upon arriving at the club, he was firmly reminded of his country roots by sections of the fans who didn’t view him worthy of managing them, the club’s ultras remarking that “pigs can’t manage”. He would lead Juventus to a second place finish in his first season in charge and was controversially sacked at half-time by the club during last game of the season… when they were still in with a chance of winning the league. After this brutal dismissal, he had developed a reputation as a nearly man, coming so close with Parma and Juventus to winning major honours but ultimately falling away. Juventus reappointed Lippi as manager – who had just been sacked by Inter – and he would go on to pip Ancelotti’s Milan to two consecutive in the following two seasons. It was after his dismissal from Juventus that a certain Silvio Berlusconi came approaching. In his own words, Ancelotti found Berlusconi to be a “passionate footballing man” with whom he could relate to. He had worked with him previously while playing for AC Milan in the 1980s and their relationship would provide the building block for a stable eight-year period with the club. You have to go back to Milan in the 1980s under Sacchi and Fabio Capello to find teams as successful as the one managed by Ancelotti from 2001-2009. Immensely popular with the players, it is said that Rino Gattuso, of all people, cried when Ancelotti announced he would leave the club for Chelsea. They would go on to reach three Champions League finals in an eight-year period, and bring home Ol’ Big Ears twice. He brought together a myriad of world class stars as Berlusconi forced expensive attackers upon him in an effort to stop Ancelotti from playing so defensively. His methods won out in the end and are proven with the success he ultimately had at the club. A disciplinarian, it is this approach and hard work which have formed the backbone of most of his teams. During his time at the Rossoneri he adapted from his traditional 4-4-2 formation, which he inherited from his time with Sacchi, to the 4-2-3-1 that is popular now. A believer of high energy, counter-attacking football, he has always demanded that his teams work hard, are willing to make sacrifices, and take risks for the good of the team. The loss to Liverpool in 2005 could be viewed by some as an example of his strengths as a manager and trainer. Most would have left that final unable to motivate the team and many would have left it without a club. But what is remembered as a dark night in Milanese minds is one that eventually led to redemption; Milan would face Liverpool for the second time in the Champions League final in 2007. This time, however, they would win. To remould the team and come back fighting after such a psychological blow is a remarkable achievement. It is no surprise that Ancelotti lasted so long under Berlusconi, where he and the players clearly had so much faith in ‘Carletto’. A career filled with silverware and the names of great players and managers, he is unique in his ability to command respect from all quarters. It is his calm approach and ability to man-manage that makes him so likeable and so effective at clubs with a previously high turnover of managers. However, questions can be asked of his reign at Milan domestically. With one of the finest sides ever assembled, Ancelotti only managed to win one scudetto, one Coppa Italia and one Supercoppa. His approach is often branded as “soft” by his critics who claim that, to his detriment, he is unable to put his foot down when it counts most. Ancelotti would leave Milan for Chelsea in May 2009, announcing his resignation two hours after the Rossoneri beat Fiorentina in the league. Chelsea is a club that often ignites debate and their owner, Roman Abramovich, plays a leading role. According to his father, Ancelotti enjoyed the Russian’s company, seeing the similarities between Abramovich and Berlusconi and describing him as “a real football man”. He had been courted by Chelsea for a year before deciding to join from Milan, and it was this like for Abramovich that ultimately led to his decision. In his first season at the club, Chelsea won the Premier League and the FA Cup – the first domestic double in the club’s history. They finished the season on 103 goals, the first team to win the Premier League and score over 100 goals since Tottenham in 1963. His second season at the London club would not be as fruitful as the first. They managed a second place finish in the end, but at one point were as low as fifth in the table. Even after the winter recruits of an ultimately overpriced Fernando Torres from Liverpool and a dodgy David Luiz from Benfica. Ancelotti was sacked two hours after his final game of the season and received a payout of roughly £4 million for his services. He is remembered for his tenure at Chelsea as a man who should have been given more time. His Chelsea side played good football, he had contained the egos in the dressing room, and everyone was united for the first time since José Mourinho. While he had developed a winning relationship with Berlusconi at Milan and was allowed the room to fail, he did not find the same breathing space at Chelsea. A mixed spell at Paris Saint-Germain would follow – including a humiliating second place finish to minnows Montpellier in the league – reigniting the old Italian belief that Ancelotti is merely a nearly man. On the field, Carletto was an Italian legend. An unremarkable player who preferred to shy away from the limelight, he has worked with some of the most iconic managers and players in history. 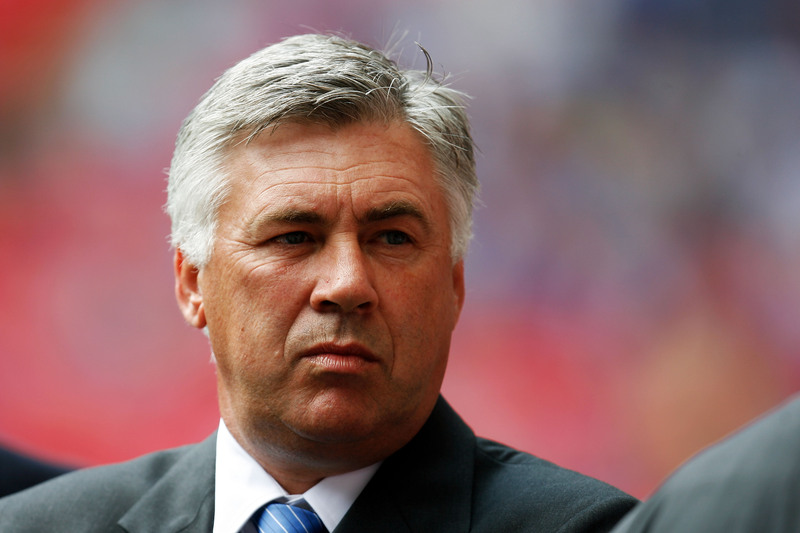 As a result, Ancelotti is a perfect fit for a team like Real Madrid, despite his humble upbringing and reserved nature. Winning the Copa del Rey and Champions League in his debut season, he was the smart choice to succeed the fiery Mourinho. A manager he has an intertwining story with, his predecessor had burnt all his bridges and alienated key players before he left the club. His reign was constantly marred with scandal in the press before his departure – not least the deplorable eye-gouging incident on Tito Vilanova and the fallings out with Sergio Ramos and Iker Casillas. A team that looked leaderless under Mourinho when the wheels had come off, they have emerged from the ashes as one that is very much together. An interesting comparison is made by some who compare Carlo the “peacemaker” to José the “warmonger”. The two narratives fit perfectly when you look at the clubs that both have managed. Carlo was the first manager since Mourinho to reunite the Chelsea squad for a sustained period of time under a single manager, and also the first man to bring them a league and cup double. He has done much the same at Real Madrid, using his humble, likeable nature to bring people together. Question marks regarding Ancelotti will always remain, however; some suggest the majority of his success has come off the back of previous managers’ hard work. It’s a false statement; previous success guarantees nothing and the Italian has consistently stamped his own authority wherever he has gone. His ability to stay out of the spotlight is remarkable and often attributed to the humble nature of his upbringing. Scandal rarely follows the man from Reggiolo. His two Champions League wins with Milan remain one of the great achievements in modern football history. When you consider the haul of trophies he has amassed from his career as a manager and a player, it is hard not to credit him as being one of the finest football minds of the last 30 years. It’s strange, then, that when we consider the greatest managers of all time – indeed, the greatest football minds – that Ancelotti is often overlooked. Perhaps it is his lack of longevity outside of Milan and his ‘nouveau-riche’ image that ultimately limits him. That shouldn’t, however, cast doubt on a career that has seen him win five European Cups, four domestic league titles, two Club World Cups and a place in the glittering Italian Hall of Fame.